Reservations are now available from February 1, 2017 for the new look Planet Hollywood Observatory at Disney Springs. 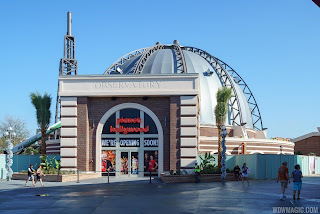 With a new turn-of-the-century inspired exterior design, inside you’ll encounter various displays of unique Hollywood artifacts and a massive 4,500-square-foot video wall featuring state-of-the-art sound and media. A revamped menu includes a selection of burgers and sandwiches by celebrity chef Guy Fieri, an assortment of shareable starters, upscale choices like a NY strip steak and the return of the World-Famous Chicken Crunch. Two new lounges will offer views of The Springs. Stargazers Bar – Live entertainment will be served up nightly on this outdoor patio. Beer aficionados can also look forward to a great range of Florida craft brews. Upper Bar – Will feature artisanal cocktails. Operating hours are 11:00 AM to 5:00 PM for lunch, and 5:00 PM to 11:45 PM for dinner. Reservations can be made at the Disney World website, or via 407-WDW-DINE. Matboukha Groove is now playing at Epcot's Morocco Pavilion in World Showcase. The high-energy group plays North African and Moroccan percussion, with Arabic and Mediterranean melodies, mixed with Latin rhythms. Matboukha Groove appears Wednesday through Sunday, with showtimes at 1:20 PM, 2:20 PM, 3:45 PM, 4:45 PM, 5:45 PM, 6:30 PM, 7:45 PM. Check out the video below of their performance. Can't view the video? Click here to watch the video. Wies N Buam, a new Bavarian folk music act is now playing at Epcot's Germany pavilion. You can catch Wies N Buam Friday through Tuesday in the Germany garden gazebo. Disney Springs is partnering with fashion advisor Melanie Pace to bring Personal Shopping Sessions to guests at Disney Springs. Melanie has appeared in “Women’s Health,” “Shape Magazine,” and “E! News” and has partnered with major brands like Amazon, Lilly Pulitzer and Jimmy Choo. Personal Shopping Sessions are $250 per hour. To book a session, visit melaniepace.com or call 321-377-1337. Paddlefish Disney Springs has just announced that it will open its doors on February 4, 2017. The completely rebuilt restaurant on the former site of Fulton's Crab House will be open daily from 11:30 AM to 11:00 PM.